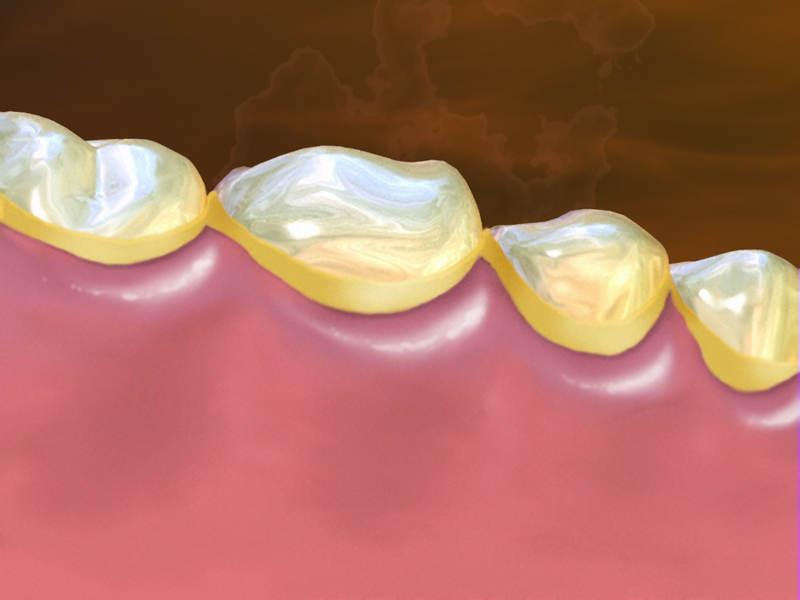 Gingivitis is more commonly known as the inflammation of the gums. 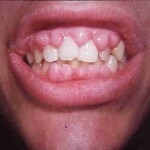 The gums are also clinically known as gingiva, hence the term gingivitis. Generally, healthy gums are pink in colour, firm, and do not bleed while brushing. However, it is almost impossible to maintain perfectly healthy gums as gingivitis it is caused by plaque (a thin biofilm of bacteria) that is adhering to our teeth. Plaque can be removed through brushing, but, they are formed again once the brushing stops. Usually, there is no need to worry about our gum’s health as long as a good brushing regimen is maintained (which is twice daily), however, it does have the potential to evolve into something more destructive, which is known as periodontitis. For gingivitis to evolve into periodontitis, it has to go through 4 stages. The first stage is known as the ‘initial lesion’, which will slowly progress into ‘early gingivitis’, ‘established gingivitis’, and then finally, into ‘chronic periodontitis’. 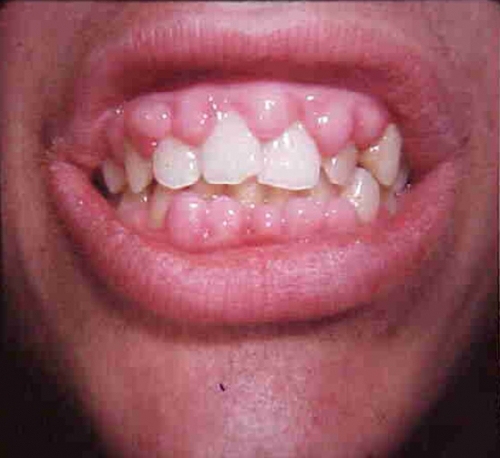 The initial lesion stage is clinically symptomless and affects almost everyone, while during early gingivitis stage, symptoms will start showing. The first symptom that can be noticed is bleeding during brushing. As the gums are inflamed, minor irritation to the gums will cause bleeding. Some people will think that it is normal and ignore this, while some people will be overly concerned about it. If this bleeding is caused by gingivitis, a quick and simple scaling will solve the problem. Another symptom of gingivitis is loss of knife edge of the gums. In a healthy gum, scalloping of the gums can be seen at the neck of the tooth, and this is known as knife edge (picture 1). When the gums are inflamed, fibroblasts begin to degenerate and collagen bundles break up, causing the gums to lose their normal shape. Other than that, the gums will be swollen and bright red in colour. This is because the vessels in the inflamed gums are dilated, causing them to be seen more easily and clearly from the surface. This is one common symptom that can be seen in any inflamed areas of the body. There will also be increased pocketing of the gums (picture 2) in gingivitis that will heal after scaling. In a normal gingiva, there is a thin layer of gums surrounding the neck of the tooth. This layer of gum can be separated from the tooth, and is known as a pocket. The normal pocket depth should be around 1mm, and any pocket more than 3mm is considered as a deep pocket. This is due to the increased collagen destruction and inflammatory swelling which causes the gingival margin to be separated from the tooth surface more easily , giving rise to ‘gingival’ or ‘false’ pocketing. The fifth symptom is sore gums. This soreness usually starts as a mild one, and will progressively becomes worse. Usually when the pain is very bad, gingivitis has already progressed to periodontitis stage. 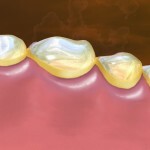 Periodontitis usually takes a very long time to heal, and requires very complex treatment. In some cases, it might not heal at all. Therefore, it is very important to maintain regular dental visits for early detection of any gum problems, and good oral hygiene. Causes of gum diseases can be broadly classified into primary factors and secondary factors. The primary cause is bacterial irritation as mentioned above. However, small amounts of plaque are compatible with gingival and periodontal health (Lang et al, 1973) and some patients can resist larger amounts of plaque for long periods without developing destructive priodontitis although they exhibit ginigivitis. Secondary factors are divided into local factors and systemic factors. Local factors are the factors that predispose the oral environment towards the accumulation of plaque deposits and prevent their removal. These are also known as plaque-retention factors. The systemic (or host) factors modify the response of the gingiva to local bacterial irritation. One of the major local factors that are affecting worldwide population is tobacco smoking. Not only it has local effects, it also has systemic effects. Other than causing gum problems, it also accelerates the progression of periodontitis. Smokers often have tooth loss, bone loss due to resorbtion, deep pocketing, stained teeth, bad breath, and swollen, bleeding gums. To protect our gums from gingivitis, a healthy diet must be maintained, along with appropriate brushing methods and regular dental checkups. Vegetables and fruits should be taken daily as they promote not only good oral health, but also is beneficial to our general health. The symptoms mentioned above might also indicate a more severe underlying disease, so if anything is bothering your gums, it is wise to seek dental consultation and treatment as soon as possible.